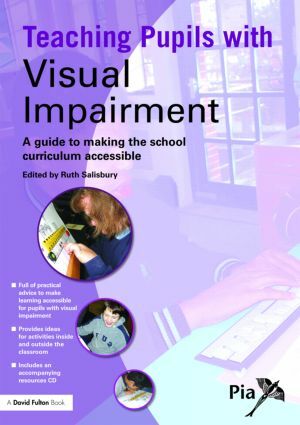 Bursting with practical advice, suggestions and handy tips, providing readers with a positive starting point for sharing ideas and good practice, this is a key practical guide to making learning accessible for primary and secondary school pupils with visual impairment. This user-friendly book shows how, with appropriate support, pupils with visual impairment in mainstream schools can have as rewarding an experience of education as their sighted peers. The majority of contributors are qualified teachers for visual impairment, with many years' experience working with pupils in a variety of settings. inclusion within the school's social environment. Teachers and support staff will have immediate access to a wealth of ideas, supported by invaluable resources on the accompanying CD/website, including a complete electronic version of the book in large print, allowing older pupils to take a more active role in the learning process.